Visit our Facebook Page for the most current project news! "Like" our Facebook page and select "Follow" to stay updated! No tours planned for 2017 . See a typical itinerary below from a past Group Tour. Tours typically include visits to Mindo Cloud forest, Otavalo, Intag Valley, and areas of interest in Quito, utilizing all locally owned businesses and operators. 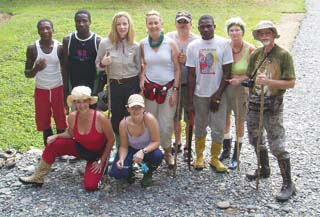 Touch The Jungle tours are a real taste of local flavor, each region different in natural habitat as well as cultures. We utilize locally & community owned businesses as an effort to help support those communities in their rainforest and wildlife protection programs. Cost of the tour is $950, you pay for your own airfare to Quito, Ecuador arriving on November 13 or before. November 7 - Fly into Quito, meet the rest of the group. November 8 - Visit the Equator, and on to Mindo (cloud forest). November 9 - Zip lining in cloud forest, visit butterfly conservatory, river tubing in the Rio Mindo. November 11 - Visit the local hot springs for a relaxing dip, visit the future site of the high school that our project will begin construction on next year. Visit with a local family and have a typical Ecuadorian meal. 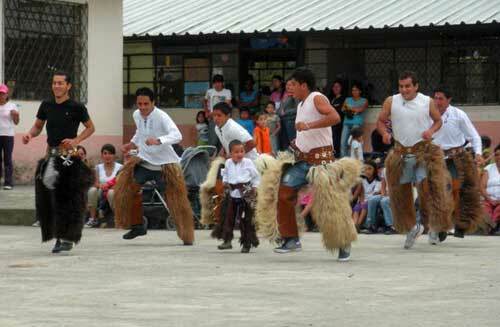 Followed by a performance by the local dancing cowboys in their traditional dance and music styles. November 12 - Visit the Apuela Sunday market, a local restaurant, visit to the hot springs. November 13 - horseback riding to the top of the mountain with awesome views. Stop to visit a local elementary school up the mountain, visit hot springs after dinner. November 14- Hike the Face of Inca, visit Agave farm and learn how they spin agave into twine. Tour of the organic coffee factory in Apuela. November 15- 1 hour horse ride or ride jeep to a Kara sun worshipping archaeological site and museum. Followed by a short mountain hike of the area. November 16- Depart Intag to a boat tour of the Volcanic Cuicocha lake, with lunch at restaurant overlooking lake, and on to Otavalo. 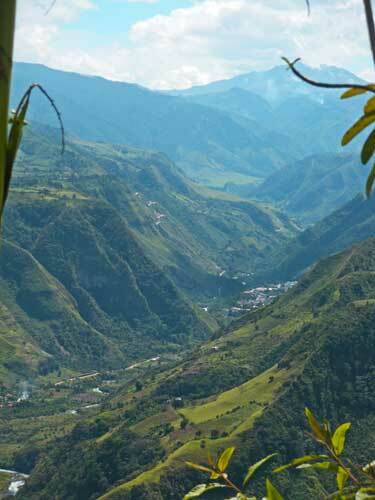 November 17- Hiking at waterfalls and explore inside a mountain that was an ancient Inca home. Visit to Quicha weavers and learn how they take raw wool and work it into a final product, then on to Coatacachi where some of the finest leather products in the world are custom made. November 18-Visit the farmers animal market, then the largest crafts market in South America, also can visit the Condor Park, a raptor bird rescue facility. November 25 - Travel back to Quito, stopping on the way at the Quito Zoo. November 19- Leave for the airport about 4am for your 6:30 flight *Or you have the option of spending the day in Quito with a guide for $100. Tour the old town, see the changing of the guards, learn some history of the Ecuadorian culture and architecture. Most everything is included in your $950 tour fee such as your lodging, private transport, most meals, bi-lingual translator, jungle guides, etc. There are a few extra activities and meals are not included in the tour fee, that you can opt to do or not at your own discretion. If you choose to do all the extras it will cost under $180 for all of them. Airfare to Quito, Ecuador is not included. Contact Grace Lush to sign up for Group Tours. Join us for an authentic Ecuador rainforest experience with the native people whose ancestors have lived on this land for more than 400 years, miles from "civilization" and modern conveniences, yet still having comfortable accommodations. Starting off with a day tour of Quito and a visit to the Equator, you'll travel on to the cloud forests of Mindo, famous for countless butterflies and hummingbirds. You'll also visit the highland town of Otavalo and experience the largest artesian market in all of South America before traveling on to the northern highland cloud forest area of the Intag Valley. 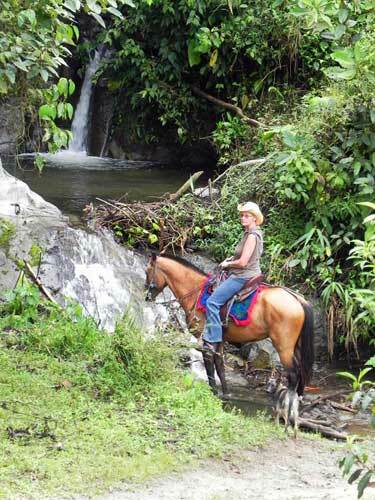 At Intag, you will experience the cloud forest by horseback, visit thermal hot springs, the Junin Cloud Forest Reserve, and local organic coffee farms before returning to Quito to prepare for your departure home. Intag is also the new home of the Touch The Jungle wildlife rescue and rehab center, starting facility construction in early 2010. The costs of these tours provide sustainable income for Ecuadorian Rainforest villages, who in turn preserve their allotted jungle areas in pristine condition. Not only do these Touch The Jungle eco-tours provide a means of preserving virgin equatorial rainforest, they also provide a life-changing "adventure of a lifetime" for those who take advantage of these very cost-effective vacations. Touch The Jungle only works with local community projects, where all of your tour fee goes towards helping support the community's effort to protect their forests. Touch the Jungle is a nonprofit proejct and we do not receive any payment for the tours nor do any outside travel agencies. 100% of your tour fee goes directly to actual travel expenses and to the local community projects. Our guides are volunteers for the project. The cost for this 2 week adventure is just $950 US excluding airfare. (Fly to Quito, Ecuador) Everything you need to get you where you will be going is included such as boat transportation to Playa de Oro, round trip private van transportation, and a local bilingual guide to answer all your questions and take care of all your needs during your trip. Because space is limited on each tour to 8 participants, please sign up as soon as possible to reserve your space. You must make a deposit of $400 to confirm your reservation on a tour, with the balance due 45 days prior to departure. Your deposit is NONREFUNDABLE if you cancel for any reason. If the Reserve or Touch The Jungle has to cancel your tour date for any reason, your entire deposit will be refunded. Tour Fees should be make payable to the nonprofit organization Earthways Foundation, but please contact our Tour Group Organizer, Grace Lush, for available space on your preferred tour date and further information before mailing tour payments. The nonprofit project Touch the Jungle works in partnership with local community projects to provide these organized ecotours to these destinations in order to help preserve this important habitat for South America's smaller wildcat species (the ocelot, margay, oncilla, and jaguarundi), and help the communities fight against environmental damaging activities like mining and logging. This is your chance to find out what is so very special about this amazing but quickly disappearing tropical rainforest, as well as to pass through remarkably different landscapes and cultures in route to and from Ecuador's beautiful capital city, Quito, through the northern highlands, cloud forests, and into the rainforest. We have organized these tours to make this incredible experience as easy as possible on you to do and also to help cut down on individual traveling expenses by sharing it with a group. All you have to do is just enjoy yourself and soak up all the fun and adventure, we'll handle all the traveling details for you. You also have the satisfaction of knowing your visit has helped preserve this habitat and native wildlife species and the communities that protect them. ALL of your tour fee goes towards helping support the community's effort to protect their forests. Touch the Jungle is a nonprofit proejct and we do not receive any payment for the tours nor do any outside travel agencies. 100% of your tour fee goes directly to actual travel expenses and to the local community projects. Our guides are volunteers for the project. 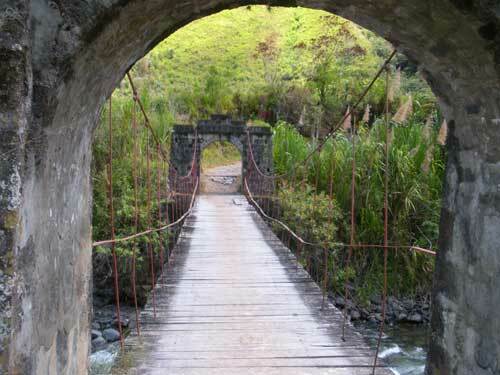 Each group tour is provided with a tour guide that intimately knows the reserve and Ecuador. 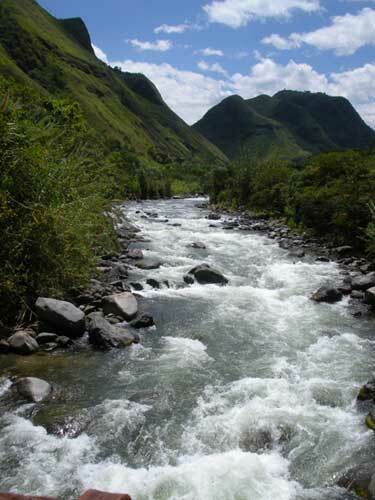 Earthways Foundation has been supporting tourism in Ecuador since 2001. Your tour guide will assist you in everything from start to finish for the tour. The benefit of going on a scheduled tour with our tour guides, is that you will not miss out on any possible activities or experiences at the reserve that you may not otherwise be aware of, not to mention that traveling in a group helps lower traveling expenses and maximize safety while traveling. You also will not be required to have the ability to speak Spanish, since a guide will be able to communicate any needs to the staff for you. We do not take in large groups to the reserve. Our scheduled group tours are small groups open to anyone interested, and we do not take over 8 people per tour maximum. Average tour size is usually about 6 people. There must be a minimum of 5 people confirmed on each tour for the tour price of $950, or the tour will be canceled because we will be unable to meet expenses. However, if less than 4 people do sign up for a tour date, we can still accommodate you. Our local tour guide, Ramiro, will still be able to offer services to you as a tour guide, and the actual traveling costs will depend on how many people are in the smaller group. We will also be happy to organize a private group tour for your own group, whether it be a group of family members, friends, church group, school group, social club, etc. Prices, services, and itinerary are the same for a private group or can be altered to fit your groups needs. Prices will be determined according to your group size and length of stay. Please contact Tracy Wilson for availability of organizing a private tour for your own group.